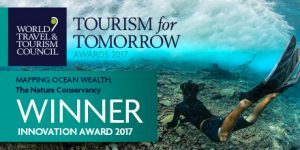 The Innovation Award recognizes initiatives which provide innovative solutions for overcoming the challenges faced by the travel and tourism sector in implementing sustainability in practice. 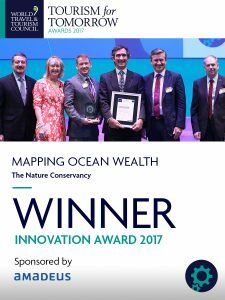 Through the Mapping Ocean Wealth project, Nature Conservancy scientists are using the latest crowdsourcing and data mapping techniques to quantify for the first time the total and local value of the world’s reefs to tourism. The resulting maps and figures are a valuable resource for managers and decision makers. Those working to prove the value of sustainable tourism have long sought to get solid figures to back up their arguments. Armed with information on the economic value of coral reef areas within their jurisdictions, governments take steps to protect an industry that brings in significant tourism dollars, while businesses can make new investments in protecting the natural systems that underpin their businesses. Models quantifying the impact of coral reef tourism estimate that each year, 70 million trips are supported by the world’s coral reefs, generating an estimated economic value of $36 million dollars. These figures can be visualized using the online mapping application, where users can also explore how tourism values, both on-reef and reef-adjacent vary by geography. A paper describing this work was published in the journal Marine Policy in 2017. We are grateful to the people and organizations that have supported this work, including the Lyda Hill Foundation, Carnival Corporation & PLC, The World Bank Group, Microsoft, National Oceanic & Atmospheric Administration, and Diane Van Wyck.